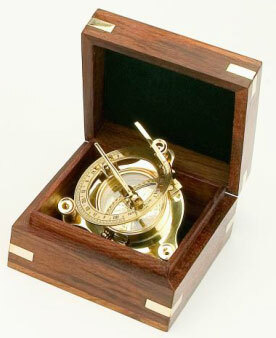 This wooden-boxed brass sundial is a completely self-contained portable instrument, inspired by a design from the 18th century instrument maker Peter Dollond, founder of a great optical empire. The original is in the London Science Museum. Instruments like this were once used by explorers and navigators to tell the time anywhere in the world. For this to be possible, the gnomon, which casts the shadow, can be set for latitude on a sliding scale and the whole instrument oriented for direction by means of a magnetic compass in the base. A spirit level and height adjustable legs ensure that the instrument is used upright. Supplied in a box measuring 4" square, 2½" tall.